An operation to recover the three missing crew members of the Rescue 116 helicopter, which crashed into the sea off Blacksod in the early hours of Tuesday morning, was continuing today. Captain Dara Fitzpatrick (45 ), who was recovered in a critical condition on Tuesday morning after the crash, passed away in hospital later on Tuesday. Ms Fitzpatrick, a mother of a three-year-old son, was spotted in the sea by the Shannon-based Coast Guard helicopter at daybreak on Tuesday and was picked up by the Achill based lifeboat and brought ashore. The other three crew members are Ciaran Smith, Mark Duffy, and Paul Ormbsy. An ongoing search operation has been under way since the helicopter lost contact with its base before 1am on Tuesday morning involving Coast Guard helicopters, RNLI lifeboats, the Air Corps, Irish Naval Service, a marine research ship which is equipped with multibeam sonar that can scan the sea bed, and local fishing boats. 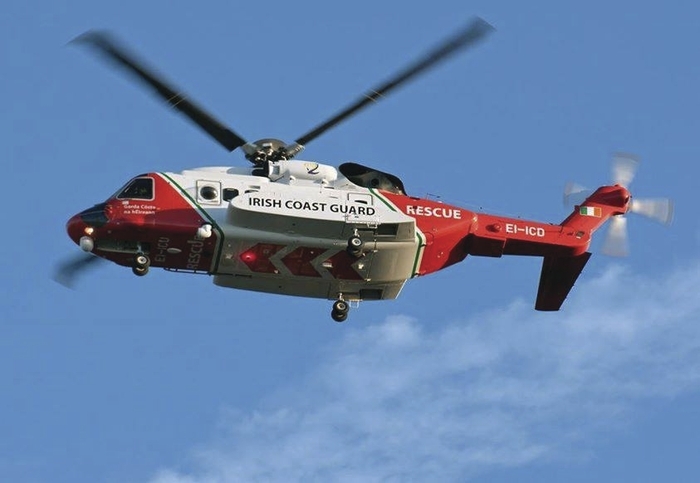 The Dublin based Rescue 116, a Sikorsky S92 helicopter, had been providing assistance to another Coast Guard helicopter, Rescue 118, which was undertaking an evacuation from a ship off the coast of Mayo and was returning to Blacksod to refuel, before it crashed. Throughout Tuesday a large amount of debris from the downed helicopter was brought ashore as the search for the three missing crew members continued throughout the day and night. Naval Service and Garda divers arrived in Blacksod to assist with the search in the waters which have a depth of between 30m and 50m in the search area, which extends out as far as Blackrock Lighthouse 13km west of Blacksod. The last message from Rescue 116 is received by the Coast Guard, informing them that they are coming up to Blacksod where they will refuel, before assisting the Sligo based helicopter - who are picking up and injured crew man from a ship at sea. Rescue 116 disappears from the Coast Guard’s screens and the Ballyglass and Achill RNLI lifeboats are sent out to look for the helicopter, alongside Air Corps and Navel Service. A number of fishing vessels also respond to the call to help the search. The Sligo based Coast Guard helicopter completes its evacuation and arrives at the scene of where the helicopter went missing, between Blacksod and Blackrock Lighthouse and spots wreckage in the water. The Shannon based Coast Guard helicopter, spots one of the crew members in the seas near Blackrock Lighthouse. The crew members was picked up by the Achill Lifeboat in a critical condition and was transferred to Mayo University Hospital. The Coast Guard, confirms that the crew member recovered earlier in the morning was Captain Dara Fitzpatrick, who was pronounced dead at Mayo University Hospital, Castlebar after being brought there, after she was taken from the sea by the Achill Lifeboat. The air search is called off for the night to resume at first light, with the LE Roisin and LE Niamh, continuing to search. The search resumed for the missing three crew members, with naval and garda divers on hand, along with the Achill and Ballyglass RNLI Lifeboard, the LE Roisin and a fixed wing aircraft and two helicopters. The search was also joined by the Marine Institute vessel, the Celtic Voyager using sonar equipment. A ping from the downed helicopter was detected close to Blackrock Lighthouse.